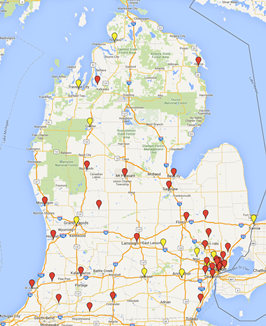 Michigan Clubhouses: Explosive and Exciting Growth! In 2008, Michigan had one, lone Accredited Clubhouse. By the end of 2016, we expect that number to jump to 20 Accredited Clubhouses. And this is just the beginning! The Michigan Department of Health and Human Services (MDHHS) has taken notice of the dramatic improvements they have witnessed in Clubhouse outcomes in those Clubhouses that have achieved Clubhouse International Accreditation. As a result, they have made Accreditation a requirement for all Clubhouse programs in Michigan. Clubhouse International, MDHHS and Clubhouse Michigan are partnering to ensure success. Our expectation is that the number of Accredited Clubhouses in Michigan will double to 30 in two years, and grow to 40 by December 2018, which is the MDHHS deadline for full Accreditation of all Michigan Clubhouses! We sincerely thank MDHHS for their support.